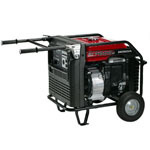 When it comes to home power generators, the EM3800S offers the best combination of features for portable home standby and other applications where electric or remote starting is required. 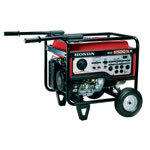 This generator comes standard with a 2-wheel kit for easy transport. 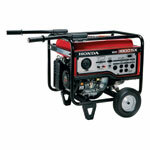 It also has the option of electric start for further convenience. Thanks to the Honda GX240 commercial grade engine, this generator can produce a maximum of 3800 watts of power and features automatic voltage regulator, auto idle, automatic choke and fuel cut solenoid for operation with the optional remote start kit.